The Tin Shop Guest Artist Program New! Come see what resident artist Chad Stayrook is working on while he lives and works at the Tin Shop! 2-6pm daily. A fun, interactive acoustic apres ski show. Attached will find the Land Title Guarantee Company January 2010 Year End Market Analysis from Summit County. Market Snapshot by Area & Property Type Comparison- comparing Full Year 2009 vs. YTD ( One month) 2010. The top graph shows the Average Price Comparison which shows the average price for Single family, Multi- Family and Residential Land showing percent change. The Median Price Comparison- compares Median Single Family, Multi-Family and Residential Land with percentage change. Sales believed to be inaccurate indicators of the market have been eliminated in this bottom report. The bottom graph shows Full Interest, Fee Simple, Arms- Length transactions. Barney Ford House Museum at 111 East Washington from 11am-3pm. 7:30 pm ALL IN THE TIMING New! Intrawest sold Copper Mountain in December, after the Vancouver-based company, known for lavishly developing ski area bases, suffered from the nationwide real estate sales decline. The company that owns Intrawest, Fortress Investment Group LLC, had to pay off debt related to ski areas it owned, including Squaw Valley in California, which it also sold. 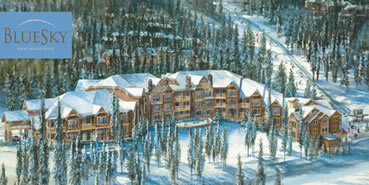 Intrawest purchased Copper in 1996 and redeveloped its base area by adding high-end condos and shops. It spent a few hundred million dollars building up Copper’s main village, a move that did revitalize the village, both in real estate dollars and entertainment and food spending. Now Powdr Corp., which hails from Utah, owns Copper Mountain, as well as the luxurious Park City Mountain Resort, Vermont’s Killington and Pico, Boreal and Soda Springs in California, Mt. Bachelor in Oregon and La Vegas Ski and Snowboard Resort. Powdr Corp. spent $107 million for Copper Mountain, which is it also soa good sign for Summit County real estate and the ski industry in general, because it affirms that a savvy company is willing to back its belief in the growth of the ski industry and related real estate. The Copper Mountain real estate transaction included 27 parcels of improved commercial real estate, 27 parcels of vacant commercial land, five vacant development parcels and some employee units, fee-simple condos and vacant residential real estate. Copper Mountain’s president, Gary Rodgers, wrote a letter to Copper Mountain real estate owners, saying the move is positive – one that will benefit not only Copper, but also Summit County Co real estate as a whole. Powdr Corp.’s corporate vision involves “preserving and enhancing (the) mountain experience for generations to come.” In doing so, it is committed to protecting the environment and has reduced its carbon footprint by 50.64%, by using energy efficient measures and buying renewable energy credits, according to its website. 11:00 am Arts Alive Presents: WinterScapes Changed! Learn the basics of sewing and make a multi purpose tote bag. Go green with your own reusable tote bag. Instruction by Kelly Landis. 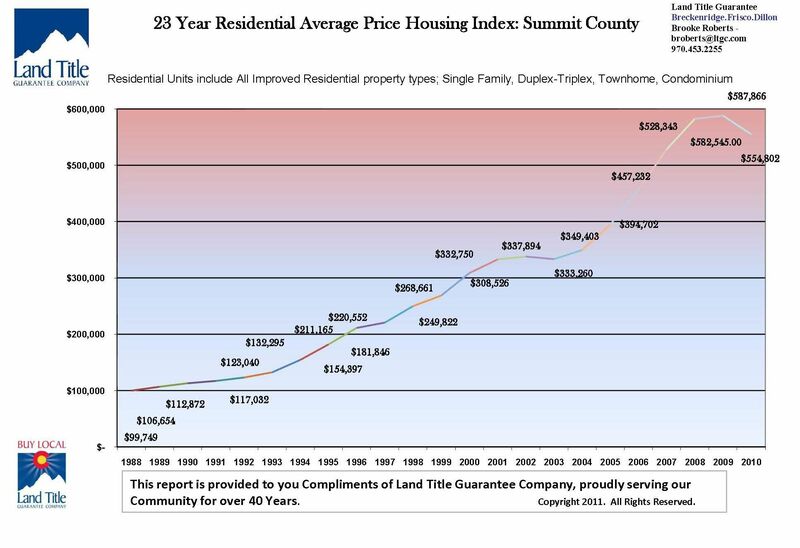 · The Land Title 22 Year Average Price Housing Index for Summit County reflecting the average price for all property types- single family, Duplex-Triplex, Townhome and Condominiums- These figures derive from the YTD Market Analysis by Area worksheet sent out several weeks ago. Best Wishes for a Fantastic 2010! The 2010 ski season is well on its way and we just had a record turnout for the X Games. It is amazing to see what people are doing on skis and snowboards these days. I hope you were able to see some of these impressive events. The Breckenridge, Keystone and Summit County real estate market is showing signs of a recovery from the down turn experienced in the fall of 2008. We have an excellent selection of Summit County condominiums, town homes, homes and home sites for buyers to choose from. There are great opportunities to get good buys – as there are highly motivated sellers making deals. We believe these opportunities are limited, so timing is of the essence. This is the best buyers market we have seen in years and we encourage you to take a look now rather than looking back later with regret. One great opportunity is the BlueSky at Breckenridge – due to the correction in the real estate market, the prices at BlueSky at Breckenridge have been reduced. There is also excellent financing available for buyers. BlueSky at Breckenridge was completely sold out prior to it’s completion in 2007. The most recent 2 bedroom 2 bathroom residence was sold for less than the listing price of $799,000. BlueSky has received wonderful reviews for its cutting edge design, accommodations, ski in ski out access and spa services. I would be pleased to send you more information on this exciting new opportunity in Breckenridge, so just send me an e-mail requesting such. With fantastic snow, fun filled events, blue skies, and great Summit County real estate opportunities, what are you waiting for? Let me know when you plan to be out this winter and how I may assist you in taking advantage of this great Buyer’s Market! I look forward to hearing from you and Happy 2010! 4:00 pm Winter Wonderlands New! Please click the link below to access the Sales Statistics. A couple of bright spots worth noting. Copper Mountain, Inc. sold to Powdr Corp for $107 M.
Breckenridge single family residence sold for $8.25 M.
Interest rates remain low and money seems to be more readily available to qualified borrowers. Alpine Bank Bldg., 2nd Flr.